Casino Calzone – Easter with Cal! Devour up to 225 Free Spins, over three days! Cal is a generous fellow, and that especially this Easter. Not only is he giving away up to 75 Free Spins, each day of the Easter Weekend but will also reward those players claiming them every day with a special Easter surprise in form of 50,000 Cals’s Cash, the currency in his in his loyalty shop where they can be exchanged for a range of Free Spins and other goodies. Ready to dive into your well-deserved Easter break and looking for some awesome holiday rewards that will stretch your gaming budget for more playtime and chances to hit some monster wins on your favorite slots? The stop by at Casino Calzone as Cal has prepared some generous offers for Free Spins on deposit throughout the Easter weekend. Plus, claim the offer every day to get an extra reward after Easter. Only one amount of Free Spins per player and are instantly added after the deposit is completed. They will expire by midnight on the same day. 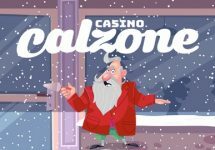 Wagering requirement is 35x FS winnings within seven days with potential withdrawals capped at €1,000 per batch and subject to the Casino Calzone bonus terms and conditions. All players, claiming one of the three offers every day of the promotion will receive an extra reward of 50,000 Cal’s Cash. To claim the reward they need to log-in on between 15:00 CET on Monday, 2nd April 2018 and 23:59 CET on Tuesday, 3rd April 2018. The reward can be exchanged for Free Spins on a variety of games and other goodies in Cal’s loyalty store.